Anyone can draw Comics and Animation! To the uninformed, drawing for Comics and Animation may seem like silly, simple nonsense. But the truth is that these are actually very sophisticated art forms based around the idea of storytelling. Far from being a simple diversion, our Comics and Animation classes are all about creating concepts and illustrating them in a way that helps to convey characters and the story of the world they live in. Best of all, you don’t have to already be a highly skilled artist to enjoy it, because anyone can be taught how to draw this way. Becoming a great artist in the realm of Comics and Animation takes patience, practice, creativity, observation, a good attitude, and a genuine interest in the material. One thing it does not require, however, is talent. Anyone, regardless of their skill when first starting out, can go through the steps and learn what it takes to draw well! Real talent is something that is earned through time and dedication, not necessarily something that one is born with. 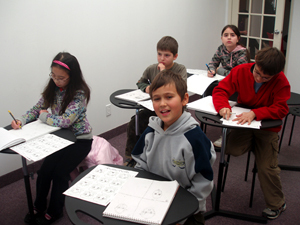 With the specially developed lessons in the Comics and Animation program, there is no reason for a beginning artist to feel intimidated. We will get you there! Drawing skill is only part of the equation. What really makes the art of drawing for Comic Books and Cartoons so fun and unique are the creative aspects of it. It’s not just about how to draw, but how to create. Great artists are the ones who explore different concepts as they create their own universe of characters, and this helps to develop their own creativity. 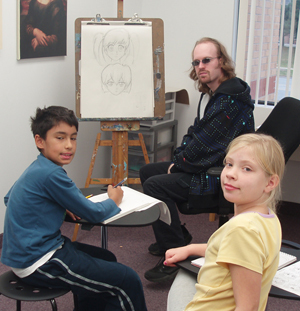 By taking the drawing techniques learned through the Comics and Animation program and applying them to their own imaginations, budding young artists can come up with a fully realized concept for a comic book or animated series, with a variety of artwork that shows it off. This kind of exercise in creative thinking is something that not only helps in the art world, but in general life as well. Author: Dylan Glassford, an intense and creative artist with over a decade of teaching experience to his name, who has dedicated his life to the world of Comics and Animation.